These colorful crepe paper flowers were handcrafted by Mrs. Lerion Jolley of the Independence community especially for this story. We Southerners are known for our long-held traditions, but gradually, as time moves on, some of these traditions are slowly being left behind and forgotten all about. Something known as Decoration Day is on the brink of becoming one of those forgotten traditions. Even though it is still faithfully observed by many country churches and cemeteries in our area, usually during the months May through June, more than likely, in the not too distant future, it will be remembered as something we used to do. For those who are not familiar with the term " Decoration Day," a good explanation would be "a custom going back for many generations of rural churches and cemeteries held for the purpose of decorating family graves and sharing a meal." This yearly event is most often on a certain Sunday once a year, and usually includes a covered dish meal and singing following the meal. Dozens of flowers, both real and artificial, are placed on the graves of those who have departed this life. 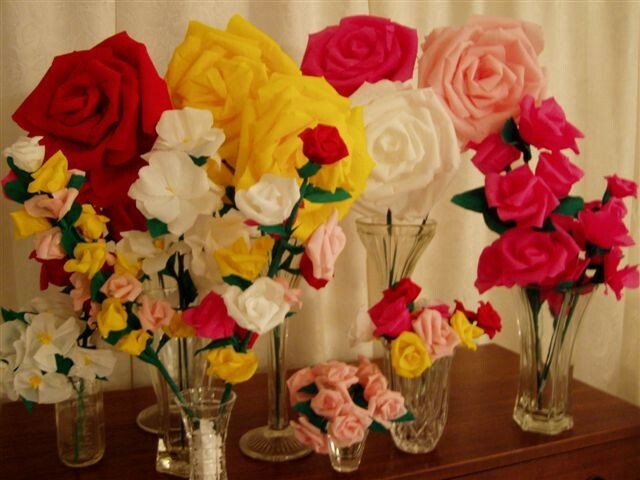 In the early 1900's, the art of making crepe paper flowers was used as a substitute for real flowers. Various types of crepe paper flowers were made to resemble morning glories, sweet peas, irises, and roses, just to name a few. Not only did the flowers look real, they lasted longer than real flowers. One problem the early makers of crepe paper flowers had was the fact that rain would cause the ink to run, making these hand made flowers very unattractive. Then it was discovered that the flowers would be dipped in wax, thus eliminating that problem. Buying the necessary things to make create crepe paper flowers would be very simple today, but not so in the days when this art was performed. Various types of wire from around homes and farms was used. Glue was sometimes made from a paste made of flour and water. Sewing thread was used to tie the flowers with. Paraffin also used for canning purposes was melted so that the flowers could be dipped in to make them last longer. Wilma (Roberts) Myers told me she always had Mrs. Tom (Alpha) Lewis of the Oakley community to make crepe flowers for her. (Mr. and Mrs. Lewis’ children’s names were Charlie, Shirley, Mabel, Harlan, Ruth, and Bonnie.) Wilma bought all colors of crepe paper, and Mrs. Lewis supplied the wire. She would make a whole basket full for Wilma and only charged $1.00 for that many. Wilma used the flowers to decorate family graves at the Roberts family cemetery in the Okalona community. My husband, Kelly Sells, remembers how his mother, Mrs. Lou Sells, would send him out into the woods to bring back stems of ferns to be included in the flowers she used for Decoration Day. He also remembers how she would use a case knife to make curls out of the crepe paper she also added in as a decorative touch with the crepe paper flowers she made. Family graves at the Nelson Cemetery in the Taylors Crossroads community held her pretty bouquets on Decoration Day. Elene (Walker) Cantrell remembers how her Aunt Susie (Bilbrey) Walker of Highland Mountain was well known in that neighborhood for her crepe paper flowers. She would start the process many months before Decoration Day arrived, using what spare time she had to work on the flowers. Supplies she used often included small limbs and twigs gathered from the woods. Glue, pliable wire along with screen wire was also used. The different types of flowers she crafted included hollyhocks, tulips, roses, and pond lilies along with the pads they grew on. Elene described the lilies as so lifelike, it was hard to tell they were made from paper. For some reason, and Elene doesn’t know why, Mrs. Walker’s colors of crepe paper was limited to only red, green, and white. Before crepe paper flowers came along, Elene also remembers how roses, zinnias, hollyhocks, lilies, and daisies would be placed in fruit jars containing water and used to decorate graves. She also told how most all country women grew asparagus in their flower gardens or in vegetable gardens as well, but not for the purpose of eating. The asparagus was used a greenery in the flower arrangements that decorated graves, but it was not called "asparagus". The name was mispronounced and was mistakenly called "spar grass." Even though flowers gathered and placed in fruit jars filled with water wilted pretty quickly, it was a much practiced tradition until crepe paper flowers caught on. 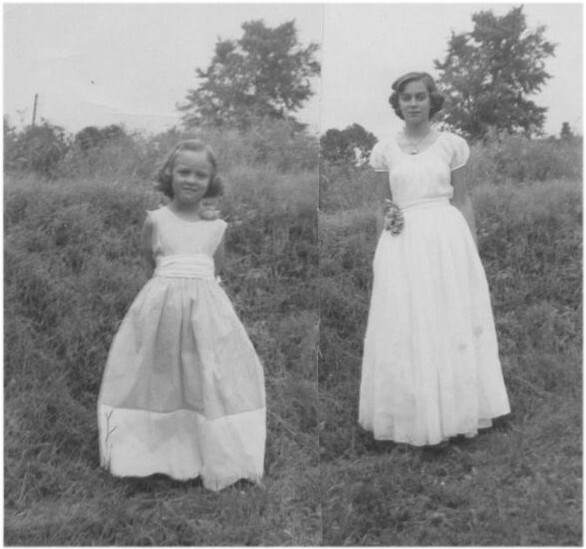 The McCormick sisters, Emily and Sue, pose for the camera in their long dresses made by their mother, Mrs. Vestal McCormick, in the late 1940's. Emily's dress is made from crepe paper. I can’t remember anyone on either my mother’s side of the family or my father’s side making crepe paper flowers, but I do recall an occasion that my mother made me a dress out of crepe paper. My sister, Sue, had to have a long dress for a school play or some type of program when she was in the 7th or 8th grade at Livingston Grammar School. Being the excellent seamstress my mother was, she made Sue’s dress for the program. After it was finished and I saw how pretty my sister was in her beautiful long dress, I decided I wanted one too. And even though my was made from crepe paper, I thought it looked as pretty as if it had been made from fabric too. Looking back on that now, I can see that it took a very creative mind to make a dress from crepe paper. I only wish I still had it. The closest thing I have to that dress is a picture that I’m including with this story. As the years continue to slip by, the time of gathering in the early summer months for the purpose of remembering those who are no longer with us will be most likely added to the list of traditions we no longer observe. The crafting crepe paper flowers is the perfect example of just how quickly a much used ritual is forgotten about. Even though it started around 75 years ago, it is already practically a lost art. And because it is so unusual to be able to find someone who still knows how to make crepe paper flowers, I’m really glad to be able to share a picture of those my sister-in-law, Lerion Jolley, made especially for this story. Thanks Lerion! The story wouldn’t have been the same without her very pretty creations!